We never need an excuse to celebrate them as we are burger-lovers all year round, but this week’s celebration of National Burger Day gave us a good excuse to look a little closer at which of our burgers is your favourite! Our best-seller – is it any surprise? 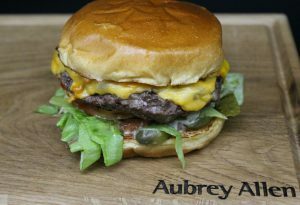 The classic chipsteak burger made with Aubrey’s dry-aged, grass fed beef and a little sprinkling of salt and pepper. Did you know we sell these in two sizes – 4oz and 6oz – with the smaller size perfect for children or smaller appetites! Your second favourite is our Lamb & Coriander burger – delicious Cornish lamb mixed with simple seasoning and fresh coriander. Try it with mint yoghurt in a pitta bread for something a bit different. In third place is the mighty Dragon Slayer – not for the faint-hearted! We added scotch bonnet chilli to our dry-aged beef and the result is a bold, fiery burger, definitely worth a try! Something new comes in 4th and it’s getting more and more popular every week…the Vintage Leicestershire burger! Made with chuck steak, Sparkenhoe Red Leicester cheese, parsley and seasoning this is a great burger to cook pink. Rounding off our top 5 is the Rustic – made with love and a real staff favourite. 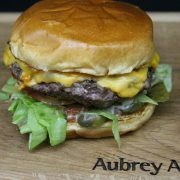 Beef onglet, Chuck steak, ox cheek and pork belly fat is minced and mixed by hand in small batches to create a juicy, meaty burger absolutely jam-packed full of flavour. https://www.aubreyallenleamington.co.uk/wp-content/uploads/2018/08/IMG_2014-b.jpg 1403 2048 aubreydeli https://www.aubreyallenleamington.co.uk/wp-content/uploads/2017/11/AA-Header-Logo-INV.png aubreydeli2018-08-24 12:54:022018-08-24 12:54:02Which burger gets your National Burger Day vote?